I'm not sure, but I think chocolate art would create a serious war in my senses. Too many desires going on at once. Do I keep it to look at, carry it around to smell it, or just munch away? Lillie Belle Farms, an actual farm/estate in Oregon complete with tasting room, produces completely edible chocolate art. Fully eat-able, from top to bottom, back to front. 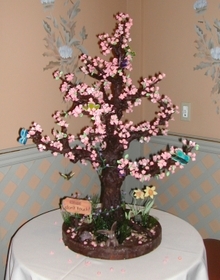 The tree shown here is one of Lillie Belle Farms' chocolate sculptures created for the Oregon Chocolate festival, made from chocolate and sugar. And have a look at their chocolate paintings. Even the frames are edible! Created by Chocolatier Jeff Shepherd, the paintings are 6" x4" with white chocolate canvases, dark chocolate frames, and cocoa butter paint. I was thinking about trying to do some chocolate artwork myself, but ... 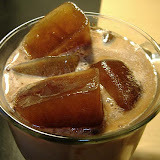 I don't know if I could keep my mouth away from the medium. What joy to do some fingerpainting, tho, eh?